Constructed about 1825, Cushman Tavern, was purchased in 1827 by Captain Samuel Cushman who operated it for many years. 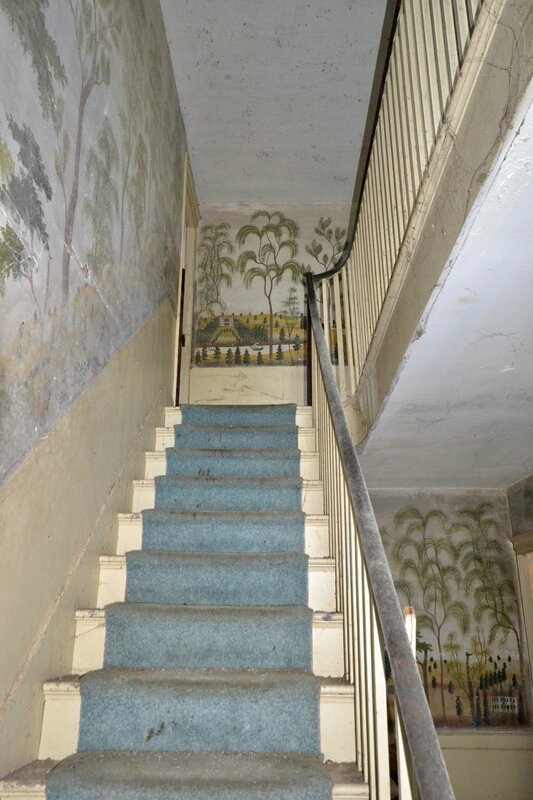 Listed in the National Register of Historic Places, this house is a significant example of late Federal-style, but its most remarkable features are the Orison Wood painted murals in the first and second story hallways and on the wall of the stairwell between. 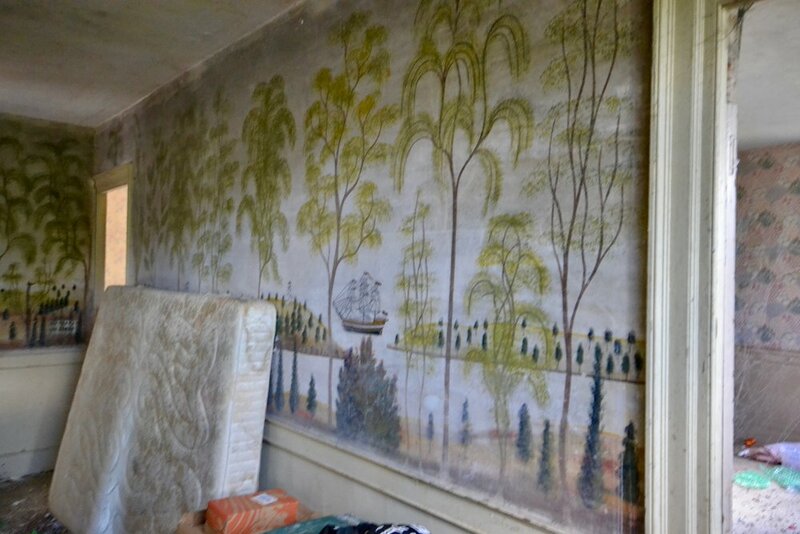 A follower of Rufus Porter, Wood painted murals in several houses in the area before 1830. From his father he learned plaster painting, and frescoed at least four houses in West Auburn, Lewiston and Webster Corner with landscapes that are clearly influenced by Porter designs. In an article in the January 22, 1927, issue of the Lewiston Journal, Captain Cushman’s daughter relays the story of how a stranger claiming to be an artist came to the door of the tavern and said that he could, “paint the walls with marvelous decorations that would advertise the Cushman House far and wide and make its name notable on the lips of the traveling public.” Their rarity and remarkable condition make these murals important examples of early American art. The tavern, currently vacant, has suffered from severe neglect that includes a failing roof and significant interior water damage. In 1840, when the town of Sabattus split from Lisbon, this property, including the house was split between the two towns, further complicating its status. Unfortunately, both Lisbon and Sabattus have agreed to issue a demolition order citing safety concerns. A contractor has also approached the towns about disassembling the building (while securing the murals) and removing all materials from the site instead of preserving the tavern in place. Maine Preservation is prepared to work with Lisbon and Sabattus—and the property owner—to seek a positive path forward that does not include demolition of the property or removal from the site, and we are willing and able to offer technical assistance and our expertise. We urge the communities to immediately delay the demolition order until there’s been an opportunity to explore the extent of necessary stabilization and rehabilitationand work with the current owner or locate a new owner to preserve it in place.